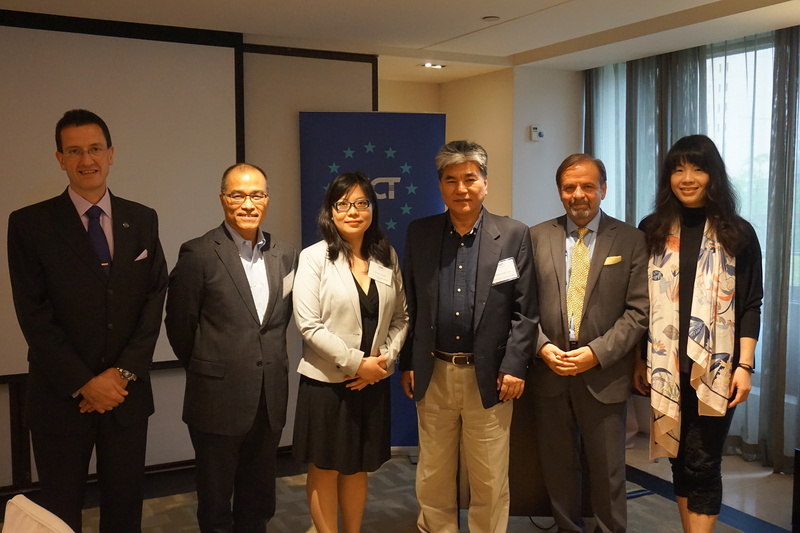 The ECCT's Low Carbon Initiative (LCI) hosted a Premium Event lunch featuring remarks by the special guest Dr Yeh Kuang-shih, Chairman, Asia Pacific Public Private Partnerships & Deputy Mayor, Kaohsiung City Government and guest speakers Dr Lee Hong-yuan, General Counsel, Kaohsiung City Government and Qiao Li-ming, Asia Director, Global Wind Energy Council (GWEC) on the subjects of climate change impact risk management and building Taiwan’s wind energy supply chain. In his remarks, Dr Yeh Kuang-shih spoke both in his capacity as Chairman of the APPT as well as on behalf of the Kaohsiung City Government, as the deputy to Mayor-elect, Han Kuo-yu. In his role as chairman of the APPT, Yeh has been promoting the benefits of productive public private partnerships that stress cooperation between government, the private sector for the public benefit, a mission he said he would continue in his new role as Deputy mayor of Kaohsiung. In his capacity as incoming deputy mayor, Yeh said that he hoped European investors would increase their investments in Kaohsiung. In his presentation, Dr Lee Hong-yuan spoke about risk management that will become increasingly important to mitigate the impacts of climate change, particularly severe natural disasters such as typhoons. He noted that he had been working for many years as an academic and government official, most notably as minister of the Ministry of Interior, on developing sophisticated models and maps to predict the impact of severe events, particularly flooding. Lee noted that during his tenure as MOI minister, the MOI established a comprehensive database of hazard maps and simulations, covering the whole of Taiwan, which can predict with a high degree of accuracy which areas will be flooded, and in what sequence, when hit with various levels of rainfall. Thanks to this extensive research and mapping exercise, authorities and developers now have a much better idea of which areas are the most vulnerable to natural disasters and which are most suitable for various types of development. Thanks to significant spending on flood-prevention infrastructure, such as dykes, canals, drainage systems and pumping stations, Taipei now has one of the world’s most advanced flood prevention system in place. Other cities lack the budgets for such sophisticated defences. Nevertheless, he made the point that weather events are becoming more and more severe. When previous flood prevention measures were designed, no one anticipated that it was possible for 1 metre of rain to fall in the space of a few hours, let alone 2-3 metres of rain over the course of a severe typhoon. It is simply not possible to plan for every eventuality. For this reason, part of emergency response planning should be to have a plan for when all measures fail. Citizens also need to be realistic about the extent of action authorities can take during a severe natural disaster. Lee’s research also showed that artificial construction is not always the answer. Sometimes it is better to preserve the natural ground water system. Lee concluded that dealing with climate change requires trusted science, informed policy and an engaged public. In her presentation Qiao Li-ming introduced the Global Wind Energy Council (GWEC) and gave an update on the global wind energy industry. GWEC is the international trade association for the wind power industry whose mission is to promote wind energy as the answer to today’s energy challenges, providing substantial environmental and economic benefits. GWEC is a member-based organisation, representing over 1,500 companies, organisations and institutions in more than 80 countries, including manufacturers, developers, component suppliers, research institutes, national wind and renewables associations, electricity providers, finance and insurance companies. Its members also include national wind industry trade associations, from both established and emerging markets, including the world largest markets of the United States, all the European markets, India and China. GWEC works at the highest international political level to create a better policy environment for wind energy. GWEC and its members are active all over the world, educating local and national governments and international agencies about the benefits of wind energy. Its activities include advocacy through its task forces and arranging events, together with local associations. In this regard, GWEC plans to cooperate with the LCI to arrange a large event in April 2019. GWEC has three task forces working for the interests of its members: one for the Latin America region, one for South East Asia (including Taiwan, Vietnam and The Philippines) and a Global Offshore taskforce. According to the speaker, it plans to start a new taskforce for Africa in the near future. The speaker reported that the global capacity of offshore wind extended to 17 countries and reached 18.8 Gigawatts (GW) at the end of 2017. 84% of this is in Europe. While offshore still accounts for only 3.3% of total global wind energy capacity, the growth rate is much faster than for onshore wind. In 2017 alone, offshore capacity expanded by 95%, according to the speaker. The sector is becoming more and more attractive given rapidly falling costs. Overall, the market is expected to grow at a cumulative annual growth rate of 16% from now until 2030. Of this, growth in Asia is expected to be the fastest and capacity in Asia is expected to account for 50% of the global total by 2030. Of the Asian markets, China’s is expected to remain the largest, followed by Taiwan, which is why so many global players are investing in Taiwan. However, the speaker noted huge challenges ahead. Most notably, she cited the announcement by the Ministry of Economic Affairs on 30 November to cut the Feed-in-Tariff (FiT) for offshore wind by 12.7%. As experience from other countries has shown, such a drastic cut in the FiT for renewable energy projects risks damaging or even crushing the development of the industry and could have severe ramifications for not only the nascent industry supply chain but also the Taiwan’s government’s reputation and its ability to attract future investment.